Every Nation Campus is Greenville Christian Fellowship’s college ministry to East Carolina University and Pitt Community College. Every year thousands of young people attend ECU & PCC to receive training and direction for success in their future leadership roles. In 4 to 5 years, the student’s lifelong direction is usually solidified in terms of career, religion, and overall moral values. We believe that the most important ingredient for lifelong success begins with an intimate relationship with God. If you are a college student, you are part of a diverse group of individuals who have all the marks of being the next “greatest generation.” You are ambitious, informed, educated, hard working and trend-setting; yet you feel a bit tumultuous, troubled, broken and independent. You know you have great potential, but sometimes it seems society won’t give you a chance, take you seriously or acknowledge that you count. 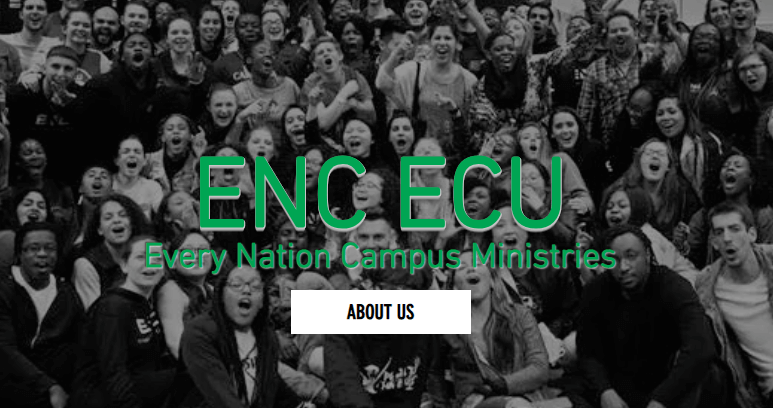 ENC is the ministry for you if you are out to find your purpose in God. Join us every Thursday on campus to be touched by God.